I'd imagine that most folks, whether they've seen Alan Taylor's Terminator Genisys or not, have already made up their minds about it by now. The film's less-than-stellar critical reception and poor domestic box office performance---outside of China, at least---have put it in the same box as 2009's dismal Terminator Salvation...which is a shame, because it's a substantially more clever and worthwhile film than what I consider to be the franchise's lowest point (and just for the record, I enjoyed Terminator 3). For those who haven't seen Terminator Genisys, here's a teaser: Kyle Reese (Jai Courtney) is sent back in time by his son John Connor (Jason Clarke) to protect Reese's future mate Sarah Connor (Emilia Clarke), who has already in fact been rescued by a cyborg named "The Guardian" (Arnold Schwarzenegger), and stop tech giant Skynet before it eventually destroys humanity. Got all that? 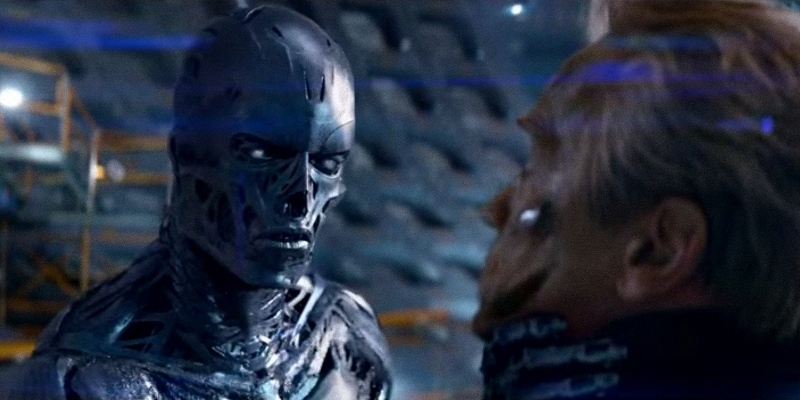 For obvious reasons, Terminator Genisys makes a valiant attempt to inject new life into the floundering franchise. None of the primary creative team---director Taylor, or writers Laeta Kalogridis and Patrick Lussier---has had any previous involvement, and no cast members (Schwarzenegger excluded, of course) return to reprise their roles. This makes Terminator Genisys easier to digest for new audiences, but those who have followed the franchise for more than a decade may have trouble adjusting to the changes. 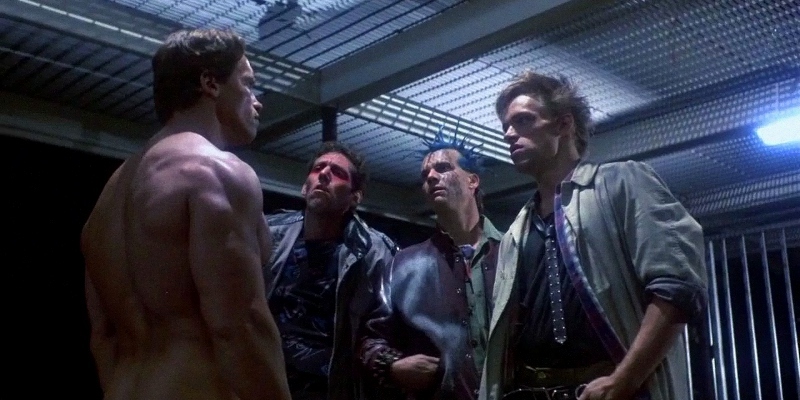 As someone firmly in the latter camp, seeing Terminator Genisys theatrically was a little too much all at once: it's bursting at the seams with new ideas, characters, and countless attempts to wedge them into an existing universe whether they actually fit or not. So why did I end up enjoying myself despite these issues, and even more so the second time around? Because it's obvious that Terminator Genisys was made with better intentions than most reboots, and the way it cleverly remixes parts of the franchise's complex history gives it a solid amount of entertainment value. There's no better example of this than Reese's first-act trip back to 1984, which recycles a number of events and locations from the original Terminator while tossing a few familiar faces that completely change the expected outcomes; I'm reminded of video games like Nintendo's NES Remix series, which similarly play around with established material to draw in new fans and surprise older ones. So unless you're squarely in the camp that says Terminator Genisys is unnecessary and the franchise should've died peacefully 25 years ago, chances are you might actually enjoy yourself. Still, let's not pretend that Genisys is a completely successful effort; due to marketing failures and attempts to please the widest possible audience, it was working with a handicap before opening day. It's true that successfully promoting a complex science-fiction film almost requires giving away a spoiler or two---heck, I probably even did it myself up there----but the trailers and teasers that led up to the film's July 1st premiere practically ruined all of them, sapping a great deal of enjoyment from anyone but those who avoided them like the plague. And like Terminator Salvation, Genisys was saddled with a PG-13 rating and thus stripped of some of the visceral, unflinching moments that made the first two installments---and to a lesser extent, the third---so brutally effective at times. But as mentioned earlier, I enjoyed myself a little more the second time around. Jai Courtney and Emilia Clarke are more tolerable as the iconic Kyle Reese and Sarah Connor once you get past the fact that they look absolutely nothing like their 1984 counterparts; the pair have good chemistry that feels safely in line with Michael Biehn and Linda Hamilton in the original Terminator. Jason Clarke's John Connor and Matt Smith's turn as the physical embodiment of Skynet still didn't do much for me; the latter feels especially tacked-on, since he's part of a final act that tends to lurch forward instead of build momentum. But the excellence of Schwarzenegger (who provides many of the film's most human moments, ironically), as well as smaller but scene-stealing roles by J.K. Simmons and Byung-hun Lee, were more than enjoyable the first time around and remain the film's smartest casting choices. Either way, you're either going to like a film like Terminator Genisys or be turned off completely. I'm obviously part of the former camp and remain cautiously optimistic for the potential sequel (thanks, China! ); after all, the franchise has gone so far down the rabbit hole at this point that we might as well enjoy the ride. Luckily, Paramount's Blu-ray/DVD combo pack---available in standard and optional 3D editions---absolutely knocks it out of the park from a technical standpoint, serving up one of the finest A/V presentations on home video to date. The lack of more bonus features (or even some sort of optional Director's Cut) leads me to believe that a more substantial edition is coming in the future...but for now, it's an enjoyable release that established fans should definitely look into. Presented in its original 2.40:1 aspect ratio, Terminator Genisys looks as perfect as expected on Blu-ray. The film's stylized color palette holds up nicely, image detail and textures are top-notch, and nearly all of the film's CGI effects blend in fairly well with the live-action footage. No obvious digital imperfections---including edge enhancement, excessive DNR, banding, compression artifacts, etc.---could be spotted along the way, ensuring that we get a visual presentation similar or equal to most theatrical showings. Make all the cracks you want about Terminator Genisys' "style-over-substance" mentality, but it's still tough to complain when the end result is this visually striking. As for the 3D presentation, I didn't see the film theatrically in this format so I can't confirm whether or not it's a faithful translation. There are effective moments and most instances are used smartly, but the experience didn't really detract or add much to my enjoyment of the film. I'd think that the 2D version would be good enough for most folks...but if you have the proper setup and enjoy the format (I'm obviously lukewarm to it), take the plunge. DISCLAIMER: These compressed and resized promotional images are decorative and do not represent the title under review. 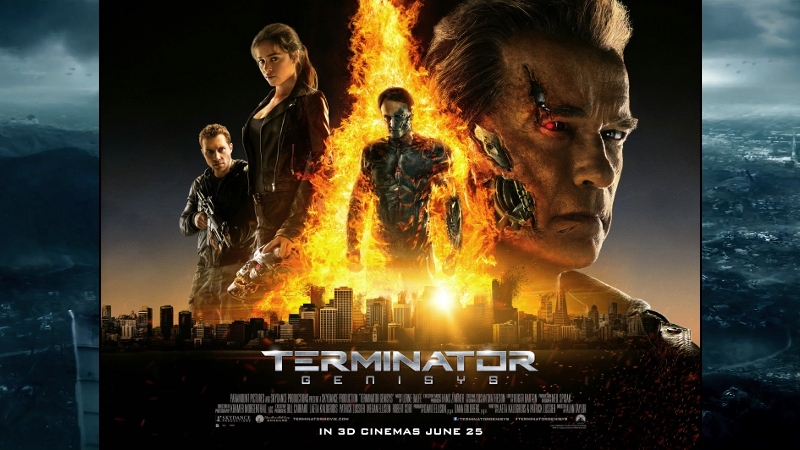 The default Dolby Atmos audio track (which automatically unfolds to a TrueHD 7.1 mix if your receiver doesn't support the new format) absolutely adds more than enough weight to give Terminator Genisys a formidable presence from start to finish. Surround channel activity is extremely frequent with strong separation, plenty of LFE punch, a strong dynamic range, and crystal-clear dialogue that's actually balanced fairly well for smaller home theater setups. There's obviously a lot going on during the film and this Blu-ray will most certainly keep your ears fully entertained. French, Spanish, and Portuguese dubs (Dolby Digital 5.1) are also included during the main feature, as is an English Descriptive Audio track. Subtitles are also included during the film in English, SDH, French, Spanish, and Portuguese. If all the surprises weren't spoiled during the film's marketing blitz, the menu also gives away plenty of secrets too...so if you'd like to be left in the dark, good luck. Navigation is smooth and simple with options for chapter selection, extras (2D Blu-ray only), and audio/subtitle setup, as well as a handy "Bookmark" interface. This three-disc set arrives in a hinged keepcase with matching slipcover; a promotional insert and Digital Copy code are also inside. Not much at all...just three featurettes that stay pretty close to the surface. "Family Dynamics: The Acting Ensemble" (15:51) is a plain-wrap overview of the casting process and on-set experience, featuring comments from actors Arnold Schwarzenegger, Jason Clarke, Emilia Clarke, Matt Smith, J.K. Simmons, Jai Courtney, and Byung-Hun Lee; producers David Ellison and Dana Golberg, director Alan Taylor, writers Laeta Kalogridis and Patrick Lussier, and more. Some of these participants return for "Infiltration and Termination: Shooting in New Orleans and San Francisco" (25:28); it's a more in-depth look at some of the more impressive locations and set-pieces used in the film, and also touches on recreating a few locations from the original Terminator, Arnold's "body double", and more. Finally, "Upgrades: The VFX of Terminator Genisys" (15:06) features a few familiar faces, plus new ones including filmmaker James Cameron (! ), VFX supervisors Sheldon Stopsack and Pete Bebb, as well as other Double Negative artists including Jamie Haydock, Maxx Leong, Gerald Blaise, Tobias Keip, Isaac Layish, David Lee, and more. Not surprisingly, there's a lot of footage from the film's most impressive visual moments (including the "future war" opening and CGI Arnold), as well as the breakdown of a few shots that you might not realize are fully computer generated. Like the other featurettes, this looks and sounds great with optional subtitles in the languages listed above. I guess I'm a minority in my enjoyment of Terminator Genisys, but it's honestly about as good as a fifth franchise entry has any right to be. But let's not pretend there's nothing wrong here: the series' timeline is almost impossibly twisted at this point, and there aren't many corners left to paint itself into. 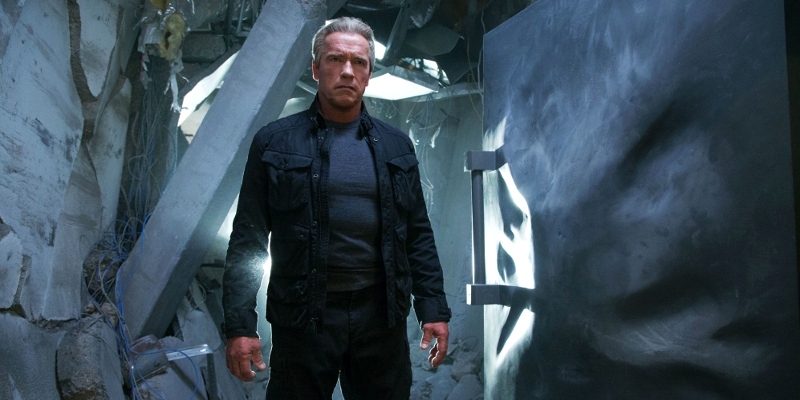 For now, the film's mostly-successful attempts to remix its own history give Terminator Genisys a good amount of entertainment value, but its second half tends to unravel at times. Overall, it's a step up from the uninspired Terminator Salvation; for that alone, it's worth a look for those who gave up on the franchise in 2009. Paramount's Blu-ray offers reference-quality A/V (including a room-shaking Dolby Atmos track) in regular or 3D editions, but the lack of extras is disappointing. Casual and new fans should rent it first, but those who enjoyed Terminator Genisys in theaters will dig this disc. Recommended.